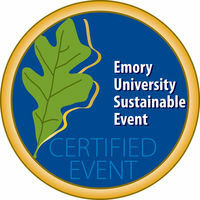 Emory's Sustainable Events Certification is a program designed to encourage and empower event planners and organizers to create events that support Emory’s sustainability vision by reducing environmental and social impacts and, in many cases, reducing costs. The Sustainable Event Certification program outlines best practices, but event planners are encouraged to be creative and go beyond these guidelines when possible. Click here to complete the Sustainable Events Certification checklist. After completing the checklist, event planners will be contacted by the Office of Sustainability to confirm their event’s level of certification and receive details about obtaining a Certified Sustainable Event banner or graphics to display at the event. Event planners will also receive a certification logo for use on event publicity and materials. If given permission, event will be featured on the Office of Sustainability Initiatives website, weekly newsletter, and social media. 1) Zero Landfill Waste: Event eliminates all polystyrene (Styrofoam) from the waste stream, provides both recycling and composting bins throughout the event space, and no extra trash cans are ordered for the event. Any pre-existing trash cans are not available for use or are repurposed and clearly labeled as recycling or compost bins. The Sustainable Events Guidance Document provides tips, hints, and justification for the items within the Sustainable Events Checklist to assist event planners achieve certification. Please reference the Guidance Document if you have questions as you complete the Certification Checklist.